Clarke Central (3-2) scored 38 unanswered points after trailing rival Cedar Shoals (3-2) 6-0 enroute to a 38-12 victory. The Gladiators have defeated the Jaguars eight straight times and lead the all-time series 35-15. Jack Mangel passed for two touchdowns to Rico Arnold and Trajan Pinkney while JaQuarus Grant returned an interception 60 yards for a touchdown for the Gladiators. NaDerrious Smith and Jarvis Howell each rushed for a touchdown for Clarke Central. North Gwinnett (3-2) used a balance attack to defeat Mountain View 38-14. Bulldog quarterback Cade Fortin passed for two touchdowns. Brian Eberhardt and Ryan Lovelace rushed for touchdowns and Javonni Cunningham returned a punt for a touchdown for North Gwinnett. Xavier Sheppard passed for three touchdowns and Joshua Vann caught two touchdown passes as Tucker (4-1) shutout M. L. King (2-3) 55-0.Tucker has scored 50+ points and recorded shutouts in two consecutive games. Lakeside-Dekalb shutout Meadowcreek (0-5) 38-0. Lakeside recorded its first shutout this season and improves to 4-1 with its only loss to Tucker. McEachern (4-1) held its third straight opponent without a touchdown in a 34-3 victory over Camden County (1-4). Harrison (5-0) extended its winning streak to five games with a 43-19 victory over Allatoona (1-4). Newton got by Heritage-Conyers 34-28. Newton head coach Terrence Banks served a one-game suspension and did not coach in the game. The Mays Raiders (2-1) won their first game without former head coach Corey Jarvis 47-28 over region foe Langston Hughes (2-1). The Raiders jumped out to a 27-7 lead and never looked back defeating Hughes 47-28. It was the first game between the two schools as region opponents. Mays leads the all-time series 2-1. The Cedar Shoals Jaguars improved to 3-0 for the first time to begin a season since 2007 with a 40-7 victory over North Oconee. Osiris Walker and Jerphari Colbert rushed for two touchdowns apiece while quarterback Akeem Glenn passed for touchdowns to Stavion Stevenson and Snipe Hall. The current three-game winning streak for Cedar Shoals is their first since 2013. Cedar Shoals hosts Oconee County next week before hosting Clarke Central in the 50th meeting of the two rival schools. Quarterback Davis Mills made a surprise start for Greater Atlanta Christian (2-1) for their cross country trip to face Valor Christian (CO). The Spartans fell 21-17 to Valor Christian (1-2) despite Mills’ surprise start. Mills suffered a non-disclosed, non-football related injury to his knee the day after a scrimmage game in mid-August and had been ruled out for 3-4 months. Mills finished 5-of-17 for 44 yards in the loss. Glynn Academy (3-1) defeated Camden County 56-7 for its third consecutive victory. Camden County is 0-3 for the first time since 1988 (two wins were forfeited) and since 1969 in games with out forfeits. Camden will face Brunswick (2-1) next week. Former Camden County running back Brandon McMaster is now at Brunswick. McMaster rushed for 100 yards and two touchdowns Friday as Brunswick defeated Wayne County 33-17. Newton downed Peachtree Ridge in a thriller 34-32 at Sharp Stadium in Covington. Myron Middlebrooks passed for the game-winning touchdown in the final minute for Newton. Blake Jones intercepted a pass in the final seconds to seal Etowah’s 28-20 victory over Newnan. It was the second week in a row Jones intercepted a pass to seal an Eagles victory. Roswell (3-0) dropped Colquitt County to 0-4 with a 34-3 win, avenging last seasons loss in the Georgia 6A championship game. Stephenson (1-2) picked up its first win of the season by handing Southwest Dekalb (2-2) its second straight loss 21-0. The Jaguars are still without head coach Ron Gartrell who is still recovering from hip surgery. It was Friday the 13th and well it was a nightmare for Beach (GA) High School out of Savannah, GA on their trip down I-95 to Kingsland, GA to take on the Camden County Wildcats. When the dusted settled Camden County would walk away with a 91-6 win over Beach. Camden County (2-1), a run oriented team, led 42-0 at the half and pulled their varsity for the second half. The JV and 9th graders would out do the varsity by putting up 49 points in the second half. Camden County racked up a modest, considering the final score, 321 yards on the ground and passed for 121-their most of the season. 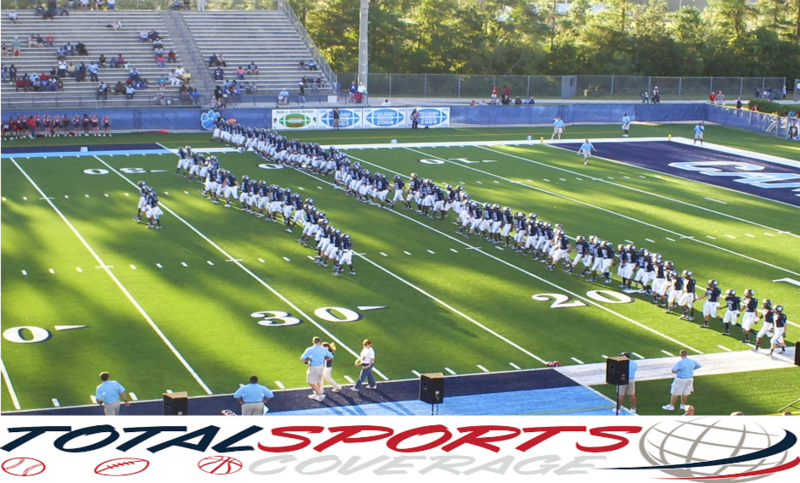 All of Camden County’s team got in on the record-setting 91 points scored vs Beach. Alabama commits Kalvarez Bessent and Chris Williams caught touchdown passes and each had interceptions while Williams took one back for a touchdown. The Wildcats finished the night with 15 ball carriers with none going for more than 50 yards for the day. Williams and Johnson finished with 41 yards on three carries each. Beach was only able to muster 85 yards of total offense, 57 coming on one run in the 4th quarter under the mercy rule of a running clock. At halftime Beach had -7 yards of total offense. Camden County will have next week off before opening region play at home against Valdosta. Camden head coach Welton Coffey was an assistant at Valdosta prior to coming to Camden County in 2006. Beach (0-3) has only scored 12 points in their first three games, will regroup and open region play hosting Region 1-3A opponent Pierce Co. (3-0) next week. North Gwinnett and Camden County were squaring off for the second time in history and the Bulldogs evened the all-time series 1-1 after a commanding 34-14 victory over the Wildcats in the season opener. Camden County was opening a new era under first-year head coach Welton Coffey who lead Raines (FL) to a state title in 1997 as the head sideline boss and spent time on the staff at Valdosta prior to coming to Camden County in 2006. The Wildcats broke out in front on a 37-yard touchdown run by Antiono Wimbush for a 7-0 lead capping a 64-yard drive set up by an interception on North Gwinnett’s second play. North Gwinnett would come right down the field led by first-time starting senior quarterback Hayden Sphire finishing a 58-yard drive with a 7-yard touchdown pass to Nate Brown to even the game at 7-7. “I was really pleased with the way Hayden [Sphire] bounced back from [the early interception], they did a great job in their coverage, they disguised they jumped into underneath man coverage at the last second, they baited him into a throw and he put it right behind him and went right back out and ran the offense,” head coach Bob Sphire said. CJ Leggett then capped a 47-yard drive with a 7-yard touchdown run to give North Gwinnett a 14-7 lead early in the second quarter. Leggett finished with 140 yards rushing and a touchdown on 12 totes for a 6.0 yard average leading the Bulldogs ground attack that put up 189 yards. Camden County would hang momentarily as sophomore Harrison Poole ripped off a 60-yard touchdown 19 seconds later to knot it at 14-all with 11:06 left in the second quarter. Poole lead Camden County with 136 yards on 12 carries and the touchdown. That would be it for the boys from Kingsland as North Gwinnett would seize control the rest of the way. “The game is four quarters and you can’t let up at any time and you got to play with a certain level of emotion and excitement throughout the entire game especially on the defensive side of the ball,” Camden head coach Welton Coffey stated. Sphire hit Caleb Scott on a 21-yard touchdown pass making it 21-14 and Wesley Edwards raced 36 yards to set up an 18-yard field goal by Michel D’Angola as the half ended giving North Gwinnett a 24-14 lead at the break. North Gwinnett continued to pour it on scoring on their opening two possession of the third quarter on a 40-yard D’Angola field goal and a 10-yard touchdown pass from Spire to Brown for the 34-14 margin that would hold until the final horn. Hayden Sphire, the son of head coach Bob Sphire, finished 15-27 206 yards 3TD 2INT while Brown led a deadly corp of receivers with 4 receptions 74 yards 2TDs. Despite two early turnovers and a third ending a drive inside the twenty in the third quarter, North Gwinnett racked up 395 yards of offense. For Camden County it’s back to the drawing board after suffering their worst margin of defeat loss since 2006 in a second round playoff lost to Warner Robins. The Wildcats were 1-6 passing for one yard and had 248 total yards of offense but were hit with 11 penalties for 113 yards. For the Wildcats that will come next Friday against Baker County (FL) at home while North Gwinnett will travel to Grayson.